So, I did it. I deleted Facebook — the app, the link, and my account. I hope you’ll continue to follow my blog, but it will no longer appear in your Facebook feed. Thanks. UPDATE: I have decided to stay on Facebook and make changes to my security settings. Long story. Thanks for sticking around with me! Here’s a podcast of the sermon I preached last Sunday, September 27, 2015, from James 5:13-20, titled “The Place, Purpose and Power of Prayer.” I hope this message is an encouragement for you in your prayer life. 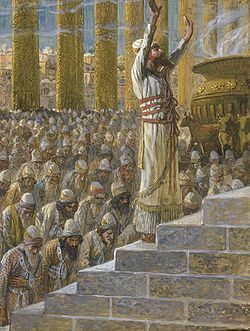 I preached this sermon on Solomon’s dedication of the Temple in Jerusalem last Sunday, August 23, 2015. The biblical text is 1 Kings 8:1, 6, 10-11, 22-30, and 42-43, the Year B lectionary reading for that Sunday. The point of the sermon is that 5 important things happen where God’s name is found.